Found in a variety of feedstuffs worldwide, mycotoxins are becoming a topic of more and more discussions. From economic impacts because of rejection of commodities at market to reduced production in animals that consumed contaminated feed, they have made their presence known. “There are a lot of questions about molds and mycotoxins out there and what impact they really have, especially on the cattle side,” stated Paige Gott, ruminant technical manager at Biomin America Inc., at the 2018 Iowa-Wisconsin Silage Conference held in Dubuque, Iowa. Biomin conducts annual surveys to assess the occurrence of mycotoxins in livestock feed. In 2017, Biomin tested 109 corn silage samples with up to 17 different mycotoxins. Sixty-two percent of the samples tested positive for at least one toxin with 32 percent testing positive for more than one mycotoxin. Trichothecenes, which include deoxynivalenol vomitoxin, were the most prevalent mycotoxins, while zearalenone was the second most frequently detected toxin. Mycotoxins are secondary metabolites produced by molds that are commonly found in feedstuffs. “Secondary just means that they are not essential for the mold to survive,” explained Gott. “They are more of a by-product that molds produce,” she added. Mycotoxins are thought to give molds a competitive advantage when compared amongst other molds and bacteria. The advantage also extends to the plant itself, giving the mold better penetration and access to nutrients. While there are many molds that can contaminate crops, only a few are known to be able to produce mycotoxins, which have a negative effect on animal health and performance. Molds producing mycotoxins can be divided into two categories based on where the mycotoxins are produced: in the field (preharvest) or during storage (postharvest). An example of a mold produced in the field is Fusarium, while Aspergillus and Penicillium are often associated with storage. There are over 400 different mycotoxins that have been identified to date. The most studied and best understood mycotoxins are often divided into six categories. Aflatoxins are the most well known and highly regulated since they have the potential to be carried over from feed into the animal’s milk. Trichothecenes, which include vomitoxin, are well known throughout the Midwest as they are a frequent challenge. Other types of mycotoxins include ochratoxin A, ergot alkaloids, fumonisins, and zearalenone. Many different mycotoxins can be produced by the same mold, so it’s not uncommon to see multiple toxins in contaminated feed. The type of mycotoxins found are also somewhat dependent upon the type of crop. Crop production practices also play a role in mycotoxin development. For example, the longer the corn crop is in the field past maturity, no matter what the reason may be, the higher the chance of contamination. Further, a crop that is slow to dry drown at harvest provides a favorable environment for mold growth, which can lead to mycotoxin production. Gott emphasized the importance of crop rotation. As previously stated, certain crops are more resistant to specific mycotoxins. By implementing a crop rotation of two or more crops, the cycle can be broken, and the probability of mycotoxin production is lessened. Postharvest factors such as storage conditions can also impact mold growth and mycotoxin production. 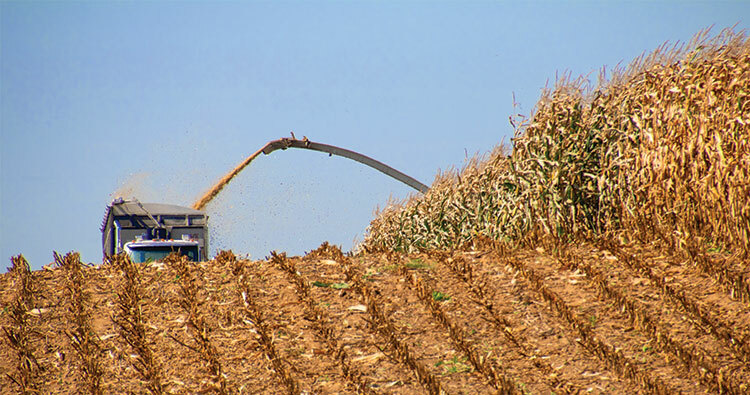 Subpar silage management such as poor packing density and mediocre feedout practices elevate the risk of contamination. Aerobic instability caused by air exposure from poor silo sealing or face management also produces an environment ideal for mold growth. “Visible contamination of mold does not guarantee that mycotoxins are present, but it does indicate that there is the potential for mycotoxin contamination,” Gott stated. Conversely, just because you don’t see a mold doesn’t mean there wasn’t a mold previously there. “Molds aren’t as resilient as mycotoxins so they may die off, but the toxins they produce will persist in the feed,” Gott explained. Having a pocket of silage infected but not visible is also a possibility. The best way to identify the presence of mycotoxins is to collect a sample and have it tested. While this may seem like a simple task, it is actually where mistakes are often made. “The largest amount of error seen in mycotoxin results can be traced back to sampling and collecting a representative sample,” Gott indicated. Since molds and mycotoxins are not evenly distributed throughout, you will often find hot spots or pockets of contaminated feed. Collecting a representative sample will get reliable results. It’s best to take a representative sample from across the bunk to get a better idea of what’s there,” she recommended. Gott continued by explaining that ruminants may become more affected by mycotoxins in the future. As we move to higher-producing animals with greater feed intakes, the passage rate of feedstuffs through the rumen will limit the amount of time microbes have the opportunity to detoxify some of these toxins. Even if microbes do help detoxify toxins, animals that are stressed are more susceptible to mycotoxin effects. Once ingested, mycotoxins can induce multiple symptoms. The ingestion of multiple types of toxins can have a synergetic response, meaning that the effects of the toxins are amplified. In general, many mycotoxins impair immune function, which elevates the risk for disease. Some toxins are also thought to hinder rumen function, induce muscle weakness, cause infertility and abortions, and damage organs such as the liver and kidneys. Chronic, low-level exposure to toxins can even lessen vaccine effectiveness, making the immune response to vaccines weaker. Currently, there are no feed additive products marketed in the United States with the claim of “mycotoxin control.” Research suggests that aflatoxins can be controlled through binding by clay mineral products, while trichothecenes (for example, vomitoxin and T-2 toxin) show little to no response to binders. Enzymatic degradation can be effective against toxins that are not easily bound such as trichothecenes and zearalenone. There is also data showing value in products that support immune function and liver health. A combination of binding, degradation, and supportive attributes can provide broad spectrum control during mycotoxin challenges. While knowledge about and testing for mycotoxins have come a long way, there is still plenty to learn. “There are still a lot of unknowns, but the knowledge base is expanding,” Gott reassured. This article appeared in the February 2019 issue of Grower on pages 32 and 33.